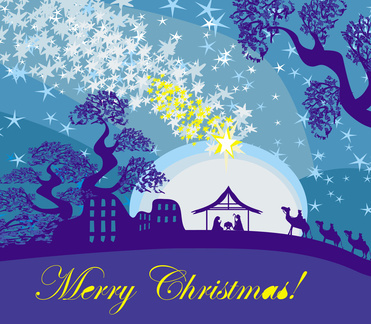 「 In this season (Christmas) which celebrates the birth of holiness into this world, join with me who decided for holiness for you. It is our task together to restore the awareness of magnitude to the host whom God appointed for Himself. 1. Be not content with littleness. But be sure you understand what littleness is, and why you could never be content with it. Littleness is the offering you give yourself. You offer this in place of magnitude, and you accept it. Everything in this world is little because it is a world made out of littleness, in the strange belief that littleness can content you. When you strive for anything in this world in the belief that it will bring you peace, you are belittling yourself and blinding yourself to glory. Littleness and glory are the choices open to your striving and your vigilance. You will always choose one at the expense of the other. 2. Yet what you do not realize, each time you choose, is that your choice is your evaluation of yourself. Choose littleness and you will not have peace, for you will have judged yourself unworthy of it. And whatever you offer as a substitute is much too poor a gift to satisfy you. It is essential that you accept the fact, and accept it gladly, that there is no form of littleness that can ever content you. You are free to try as many as you wish, but all you will be doing is to delay your homecoming. For you will be content only in magnitude, which is your home. 3. There is a deep responsibility you owe yourself, and one you must learn to remember all the time. The lesson may seem hard at first, but you will learn to love it when you realize that it is true and is but a tribute to your power. Believe the little can content you, and by limiting yourself you will not be satisfied. For your function is not little, and it is only by finding your function and fulfilling it that you can escape from littleness. 4. There is no doubt about what your function is, for the Holy Spirit knows what it is. There is no doubt about its magnitude, for it reaches you through Him from Magnitude. You do not have to strive for it, because you have it. All striving must be directed against littleness, for it does require vigilance to protect your magnitude in this world. To hold your magnitude in perfect awareness in a world of littleness is a task the little cannot undertake. Yet it is asked of you, in tribute to your magnitude and not your littleness. Nor is it asked of you alone. The power of God will support every effort you make on behalf of His dear Son. Search for the little, and you deny yourself His power. God is not willing that His Son be content with less than everything. For He is not content without His Son, and His Son cannot be content with less than his Father has given him. 5. I asked you earlier, "Would you be hostage to the ego or host to God? " Let this question be asked you by the Holy Spirit every time you make a decision. For every decision you make does answer this, and invites sorrow or joy accordingly. When God gave Himself to you in your creation, He established you as host to Him forever. He has not left you, and you have not left Him. All your attempts to deny His magnitude, and make His Son hostage to the ego, cannot make little whom God has joined with Him. Every decision you make is for Heaven or for hell, and brings you the awareness of what you decided for. 6. The Holy Spirit can hold your magnitude, clean of all littleness, clearly and in perfect safety in your mind, untouched by every little gift the world of littleness would offer you. But for this, you cannot side against Him in what He wills for you. Decide for God through Him. For littleness, and the belief that you can be content with littleness, are decisions you make about yourself. The power and the glory that lie in you from God are for all who, like you, perceive themselves as little, and believe that littleness can be blown up into a sense of magnitude that can content them. Neither give littleness, nor accept it. All honor is due the host of God. Your littleness deceives you, but your magnitude is of Him Who dwells in you, and in Whom you dwell. Touch no one, then, with littleness in the Name of Christ, eternal Host unto His Father. 7. In this season (Christmas) which celebrates the birth of holiness into this world, join with me who decided for holiness for you. It is beyond all your littleness to give the gift of God, but not beyond you. For God would give Himself through you. He reaches from you to everyone and beyond everyone to His Son's creations, but without leaving you. Far beyond your little world but still in you, He extends forever. Yet He brings all His extensions to you, as host to Him. 8. Is it a sacrifice to leave littleness behind, and wander not in vain? It is not sacrifice to wake to glory. But it is sacrifice to accept anything less than glory. Learn that you must be worthy of the Prince of Peace, born in you in honor of Him Whose host you are. You know not what love means because you have sought to purchase it with little gifts, thus valuing it too little to understand its magnitude. Love is not little and love dwells in you, for you are host to Him. Before the greatness that lives in you, your poor appreciation of yourself and all the little offerings you give slip into nothingness. 9. Holy child of God, when will you learn that only holiness can content you and give you peace? Remember that you learn not for yourself alone, no more than I did. It is because I learned for you that you can learn of me. I would but teach you what is yours, so that together we can replace the shabby littleness that binds the host of God to guilt and weakness with the glad awareness of the glory that is in him. My birth in you is your awakening to grandeur. Welcome me not into a manger, but into the altar to holiness, where holiness abides in perfect peace. My Kingdom is not of this world because it is in you. And you are of your Father. Let us join in honoring you, who must remain forever beyond littleness. 10. Decide with me, who has decided to abide with you. I will as my Father wills, knowing His Will is constant and at peace forever with itself. You will be content with nothing but His Will. Accept no less, remembering that everything I learned is yours. What my Father loves I love as He does, and I can no more accept it as what it is not, than He can. And no more can you. When you have learned to accept what you are, you will make no more gifts to offer to yourself, for you will know you are complete, in need of nothing, and unable to accept anything for yourself. But you will gladly give, having received. The host of God needs not seek to find anything. 11. If you are wholly willing to leave salvation to the plan of God and unwilling to attempt to grasp for peace yourself, salvation will be given you. Yet think not you can substitute your plan for His. Rather, join with me in His, that we may release all those who would be bound, proclaiming together that the Son of God is host to Him. Thus will we let no one forget what you would remember. And thus will you remember it. 12. Call forth in everyone only the remembrance of God, and of the Heaven that is in him. For where you would have your brother be, there will you think you are. Hear not his appeal to hell and littleness, but only his call for Heaven and greatness. Forget not that his call is yours, and answer him with me. God's power is forever on the side of His host, for it protects only the peace in which He dwells. Lay not littleness before His holy altar, which rises above the stars and reaches even to Heaven, because of what is given it.